There is no relationship in the entire earth in which agreement is more necessary than marriage. It is the most heightened level of agreement that is necessary in marriage, because two people become one. It’s the only relationship that we have in which two become one, physically and spiritually you become one. And so if one is at complete differences with the other, you’ve got a formula for disaster. That’s the Buddhist philosophy of yin and yang. Good and evil coexisting together, both in a constant state of war to create a one. That’s Buddhism, that’s Daoism, that Confucianism. It’s not Christianity. We don’t believe in yin and yang. We believe the two should be one, they need to be in agreement. I mean, my main reaction is just: LOL. 1) “Good and evil coexisting together in a constant state of war to create one” is not the Buddhist philosophy of yin and yang. 2) “Good and evil coexisting together in a constant state of war” is more of a Hindu concept, which for some reason didn’t even make it onto Phillips’s list of religions. 3) Relating “good and evil” to yin and yang is a American/Westernized thing; it’s not a faithful interpretation of yin and yang in their cultural and historical contexts. 4) Buddhism is not the same as Daoism. 5) Daoism is not the same as Confucianism. 6) Confucianism is not the same as Buddhism. 7) When “yin and yang” is properly understood, Christianity actually does express similar sentiments. I will not bore my readers with a detailed explanation of Buddhism, Daoism, and Confucianism. But I would like to at least explain “yin” and “yang” briefly, because — hey, I rarely have the opportunity to apply my M.A. directly in my work with HA. I might as well take advantage of this rare opportunity. Both yin and yang are traditional Chinese characters. Here’s yin: 陰. Here’s yang: 陽. If you notice, on the lefthand side of each character is the same “mini-character”: 阝. 阝signifies a mound or hill. When combined with 侌, which signifies “cloudy,” you get what we think of as “yin,” which signifies the cloudy or shadowy side of a hill. On the other hand, when 阝is combined with 昜 (which signifies “bright”), you get “yang,” which signifies the sunny or bright side of a hill. Thinking of a hill is probably the easiest Intro to Yin and Yang I could give you: it’s the same hill, but it has two sides: a cloudy side and a sunny side. The sides aren’t “in a constant state of war”; rather, they’re two sides of the same coin and — despite unique characteristics and personalities — work together in harmony. Which, if you think about it, is an interesting metaphor for marriage. Tao gave birth to the One; the One gave birth successively to two things, three things, up to ten thousand. These ten thousand creatures cannot turn their backs to the shade [yin] without having the sun [yang] on their bellies, and it is on this blending of the breaths that their harmony depends. To be orphaned, needy, ill-provided is what men most hate; yet princes and dukes style themselves so. Truly, “things are often increased by seeking to diminish them and diminished by seeking to increase them.” The maxims that others use in their teaching I too will use in mine. Show me a man of violence that came to a good end, and I will take him for my teacher. But that’s just Daoism — and that’s just one interpretation of one Daoist text written by one Daoist. 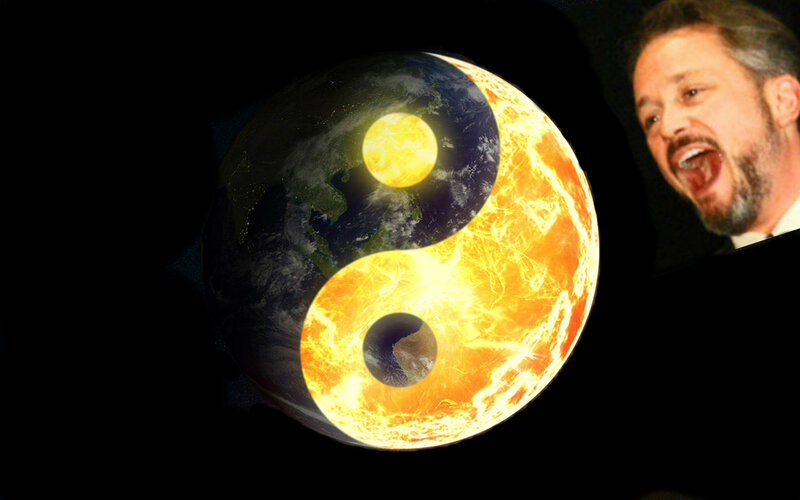 How Daoism (as well as Buddhism and Confucianism) thinks about and applies the idea of yin and yang is as diverse as how American Christians think about and apply the idea that humans are made in God’s image. It’s completely sloppy (and unfair) to just group all those religions and their denominations together and make sweeping generalizations. For example, some American Christians think the “humans in God’s image” concept necessitates we accept and love LGBT* individuals; other American Christians think the same concept justifies bigotry and discrimination. If American Christians wouldn’t like being made into unfair caricatures, they ought not make unfair caricatures of other religions and people groups. Making unfair caricatures of other religions and people groups is a serious problem in the Christian homeschooling subculture and American Evangelicalism in general. (It’s also a problem that plagues other cultures. No uniqueness here.) I have talked about this previously in my “How I Learned to Stop Being Afraid and Love Other Religions” series. When I realized that curriculums and ideas created and advocated by everyone from David Noebel to Ken Ham to Worldview Weekend to James Dobson was passing on nothing but soundbites and straw men of other people’s beliefs, I felt upset. And confused. If homeschool leaders actually want to raise up a generation that is taken seriously in the public square, they owe that generation the truth. They owe it an accurate and generous understanding of opposing viewpoints: whether those viewpoints be Buddhist, Daoist, Confucian, or even atheist. Color me not surprised that Doug Phillips doesn’t understand Eastern religions. Also, thanks for the shout-out. Hmm, he appears to have just taken some ‘fancy’ concepts and described them the way he wants them to be seen. He probably assumes that all of his fans / followers are in too much awe of him to argue. After all, he’s Dough Phillips, he knows all about those nasty religions. How is Richard Dawkins’ boxing together all religions (including Christianity) any different from Christians’ boxing together all religions EXCEPT Christianity? Dawkins intelligently understands the world through the laws of physics, not any religious faith, because only the laws of physics apply to ALL human beings. Religious laws apply only to the believers of their particular religions. That’s the difference. It’s different because atheism and antitheism are *not* religions and christianity *is*. Anne Rice fans, True Blood fans, and Twilights fans are perfectly entitled to argue over the true nature of vampires and how one author got it right and the others got is wrong. Dawkins just says they don’t exists so they’re all wrong. I was years into adulthood before I first heard the “other side” accurately or fairly represented. My continued astonishing discoveries about Other People made me realize my parents didn’t care as much as they should have about being fair to the “other side”. NO, homeschooling parents, we are not expecting you guys to be experts on the arcane details of every possible worldview. All we ask is that you (to whom this pertains) cease passing off stereotypes as facts. If only because it makes us trust you less.